Black heavyweight single LP with printed outer wallet and printed inner wallet. Frank Turner will release his next studio album on August 7th through Xtra Mile Recordings and Polydor Records. “Positive Songs For Negative People” is the singer-songwriter’s sixth album and the follow-up to 2013’s critically-acclaimed “Tape Deck Heart”. It was made with his trusted backing band The Sleeping Souls and produced by Butch Walker in Nashville. The first taste of the album is the single ‘The Next Storm’ The video features Turner in the boxing ring with CM Punk, the longest-reigning WWE Champion of the modern era. It has been an eventful decade for the troubadour from Winchester. As he turned his attention towards his sixth album at the tail-end of 2014, Turner thought back to his debut. “When a band makes a debut record, there’s a freshness and excitement to it that bands often lose as time goes by,” he says. “I wanted to try and make a record with that young, exciting feel.” The idea was that Frank and his band would capture the exhilarating thrill of their live show. Like much of Turner’s work, it is a record that takes Life’s Big Issues – triumphing over the darkest adversities – and places them inside a mix of beguiling, intricate vignettes and sweeping anthems. Josephine is a punky singalong and Mittens is a fist-clenched song of defiance whilst tracks such as Glorious You and Demons pack a bittersweet emotional punch. That it begins with The Angel Islington, a tribute to North London, and ends with Song For Josh, a touching eulogy recorded live at the 9.30 Club in Washington, is an apt reflection of the journey Frank Turner has made over the past 10 years. He has made homes from home, and formed strong bonds along the way. 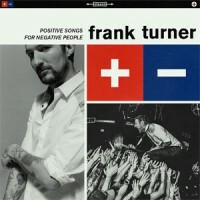 “Positive Songs For Negative People” is Turner at both his most reflective and celebratory.